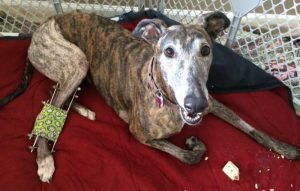 So you have fallen for those soft greyhound eyes and are thinking that a greyhound may be a wonderful fit for your family. 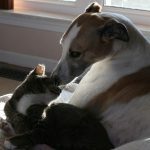 If you have not been owned by a greyhound before, there are some things to know and consider before taking the plunge into adoption. First, know that we are here to assist you every step of the way. You might start with our Frequently Asked Questions. Then, if you have additional questions or just wish to understand these beautiful creatures better, please call us so that you may talk with a MCGR representative. We really, really love to talk about greyhounds. Take the time to fully understand what greyhounds are like. We at MCGR can help you to determine if they are a breed for you and your lifestyle. It is our goal for every potential adopter to have realistic expectations and for every greyhound to find his forever home. 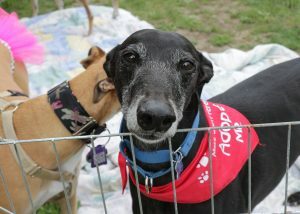 If you haven’t met any greyhounds in person, please come a meet and greet to see the dogs and talk with our volunteers. Some excellent reference books that we recommend are “Retired Racing Greyhound for Dummies” by Lee Livingood and, if your dog will have contact with children or you just want to learn great information about how dogs think and express their thoughts, please read “Living with Kids and Dogs…Without Losing your Mind” by Colleen Pelar. MotorCity Greyhound Rescue adopts to individuals and families with children aged 4 and older. If you have children under the age of 6, we require that you have a fenced yard. Please note that greyhounds should never be put on a tie-out or running wire. These can be deadly to a sighthound. Also, invisible fencing is a cruel means of containment that just does not work with a sighthound. They can run right through it and it also does not prevent stray animals from entering your yard. Adults and families with older children are not required to have a fenced yard, however, you must be committed to taking your dog out regularly on a leash. Greyhounds absolutely must be kept in a properly fenced area or on a hand-held leash. MCGR greyhounds are fostered in family homes. Foster families help the greyhounds become accustomed to the people, objects, sounds, schedules, freedoms and rules found in most homes. We do our very best to evaluate how each dog responds and interacts with cats, small dogs and older children. We primarily serve the southwest Michigan, southeast Ontario and Toledo, Ohio areas. We can adopt to families within a four hour radius of Detroit. Our adoption fee for each racing greyhound is $275.00. For dogs age eight or older, the adoption fee is $150.00. The adoption fee for dogs received from China and for the Spanish galgos and podencos is $625.00 and $250.00 for dogs age eight or older. This fee helps us to defray some of the expense of necessary vetting for each dog as well as the transportation expenses. Our greyhounds each receive a comprehensive physical exam and are fully vaccinated. They are spayed/neutered and given dental treatment as needed. Each hound is tested for heartworm and any injuries are evaluated and treated. Each foster dog is started on monthly Heartgard Plus and Frontline Plus during the flea/tick season. We want to be sure that each dog is healthy at adoption time and, if there is any medical concern which may require future treatment, it is fully disclosed to the potential adopter. Greyhounds are sweet and sensitive dogs. They are companion dogs and want only to be with their people. Bringing a greyhound into your family will bring years of joy, however it also requires a commitment on your part. 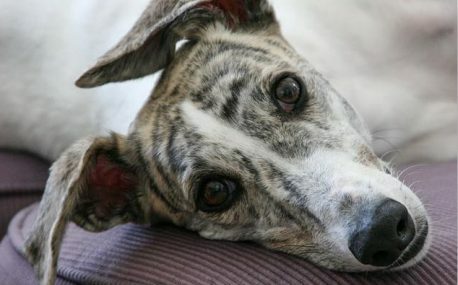 A greyhound may live an average of 12-14 years. Please be sure that you are prepared for the financial aspects of having a dog. Also be certain that you are ready to devote the time, attention and training a dog needs in order to become a happy and well behaved family member for the duration of his life.